In search of Vanessa, his first love, Vincent J. Christopher graduates from college and reports for duty in Vietnam as a young U.S. Army chaplain. Trained to fulfill his first commission, providing spiritual guidance and comfort to the soldiers in First Squad, he’s unknowingly chosen for initiation into the realm of Immortal Keepers. If successful, he will receive a second commission, gathering God’s elect and preparing them for the upcoming end time battle. The day before his twenty-first birthday, he dreams of time traveling between 1967 Vietnam and 33 A.D. Jerusalem, reliving the agonizing deaths of his squad members, as well as witnessing the three-year ministry of Christ. When Vincent realizes he may be trapped in ancient Jerusalem and forced to visually endure the horrific torture of Christ’s crucifixion, he struggles against his fate. Throughout his tour of duty, Vince teaches his squad members about the second coming of Christ, each example triggering a dream that hurls them from the battlefield to the first ministry of Christ. A Dream Before Dying entertains while it instructs, combining the fantasy of The Wizard of Oz, the conflict of Platoon, and the emotion of The Passion of Christ. This story answers many questions on the minds of bible students passionate about the Word of God, provoking them to think outside popular theories. It's a bible study and an amazing story. Some of the topics include: Where do we go when we die? Is there a difference between saved and born again? What lessons can we learn from the raising of Lazarus, and the 12 year old girl? Why do loved ones betray each other in the end days? The Rapture theory, how to understand the "anytime" doctrine. What did Jesus mean when he said...? and much more. It is not my intention to tell readers what to think. However it is certainly my intention to provoke readers to think about everything they have been taught about God’s word and use A Dream Before Dying/The Initiation as a resource for wisdom and knowledge. 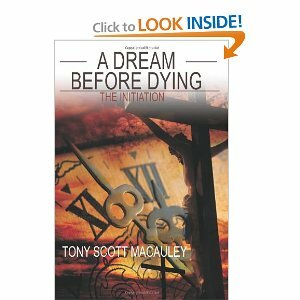 In A Dream Before Dying by Tony Scott Macauley readers are taken on a journey of one man’s dream and the endurance of his commission. On a mission to find his first love, Vincent Christopher, an Army Chaplain, provides spiritual guidance and support to soldiers. Vincent is recruited on a second commission, which involves him traveling through time and experiencing different lessons that he is to teach his soldiers. If Vincent is successful he will become the gatherer as well as their trainer for battle. A Dream Before Dying is a story of learning, growth, and support. This powerful and spiritually written book will have readers hanging on to every lesson. The author’s writing style is direct and entertaining. I enjoyed the military feel of the book. I recommend A Dream Before Dying to others. Thank you for spotlighting my new novel. This whole experience with you and your site has been very inspirational. Thank you for your honest opinion. Tony, It was a pleasure hosting you and A Dream Before Dying on our blog. Your book is an inspiration and Authors & Readers Book Corner wants to help others learn about it. Keep up the good work and we look forward to reading more from you.